Canada is a land of wide open spaces with much to see and explore. The incredible diversity of the Canadian landscape allows for every type of outdoor recreation and adventure. When you visit Canada you can enjoy hiking, canoeing, rafting and cycling in the summer, skiing, snowshoeing and other winter sports when the snow blankets the mountains - there's always a great reason to get outside and experience nature. If you'd like to go hiking in the Canadian Rockies or canoe while surrounded by mountain peaks, Fresh Tracks can provide you with an unforgettable vacation in Banff, Alberta. The Banff National Park in Alberta, Canada is situated in the Canadian Rockies and the dramatic and breathtaking snowcapped peaks and scenic valleys of the region make the perfect place to enjoy horseback riding as you take in the beauty of the mountains. There are many trails in the park which are perfect for riding as you enjoy the sights. Horseback riding is a unique way of experiencing the natural beauty of the Banff National Park, Alberta and one which provides a clean break with your daily routine. On Canadian vacations, you can get far away from your daily life and forget about its stresses – and what better way to unwind than a horseback ride through one of the world's most beautiful places? If you'd prefer other activities, there's many more to choose from at Banff National Park, Alberta. If you've come in the summer, the park is one of the best places to visit in Canada for rafting and canoeing. The sparkling emerald green waters of Lake Louise are perfect for novice level rafting and canoeing and you can enjoy an afternoon on the water as you marvel at the beauty of the mountains. There are canoe and rafting trips available in the park ranging from leisurely to pulse-pounding class IV rapids rafting. 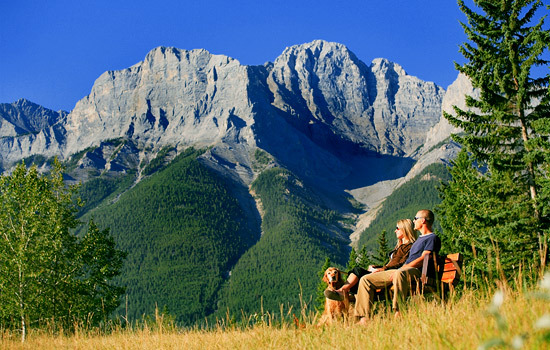 The excitement of these excursions is the highlight of many Canadian vacations in the Rockies. The Bow River, The Kicking Horse River, The Highwood River and Horseshoe Canyon await your visit to Banff National Park, Alberta where there is adventure to be had all year long. In the winter, there's no better place to be than the Canadian Rockies; it's a skier's paradise. Exciting downhill and cross country skiing opportunities abound and you can also enjoy snowshoeing, winter hikes and wildlife observation and even take a dogsled ride! It's an iconic Canadian sport and a wonderful way to experience a slice of Canada's history. No winter Canada tour is complete without a little dog sledding, after all. Whether you'd like to hit the slopes or enjoy a summer's day on a hike through alpine valleys filled with wildflowers, Fresh Tracks can make your visit to Banff National Park, Alberta the experience of a lifetime. Need more information on Visit Banff National Park in Alberta? Talk to one of our Canadian travel Insiders who'd be happy to answer all your questions. We make it easy to plan a worry-free seamless travel experience in Canada by combining our insider knowledge with your personal preferences. Your trip is personalized to your needs and all components are booked for you, so you can just relax and enjoy your experience. Get inspired by reviewing the collection of our hand-picked Canadian journeys – ones that we've done many times, and think are the best way to truly experience Canada. We will help you narrow down your choices – where to go, where to stay, what to do on your trip, and create a personalized trip plan and quote that is tailored to you. When you're happy with the itinerary that we've co-created, we'll book all the components of your journey and send you a confirmation that everything is arranged for your trip. Before you travel, we'll send you your detailed travel plan, with everything you need to go on your journey. All that's left to do now is arrive in Canada and enjoy your trip. Ready to start planning your Canadian journey? Get your FREE personalized trip plan and all your questions answered by our friendly, knowledgeable Canadian Insiders.